SkySat-3 to 21 (SkySat C1 to C19) are commercial Earth observation satellites by Skybox Imaging, licensed to collect high resolution panchromatic and multispectral images of the earth. The satellites operate in a polar inclined, circular orbit at approximately 450 km above the earth. Skybox becomes only the fifth organization licensed to provide high resolution space-based imagery of Earth. The first two prototype satellites were built by Skybox Imaging in house. The first satellite was launched in 2013 on a cluster launch on a Dnepr rocket. The second identical satellite was launched as a secondary payload on a Soyuz-2-1b Fregat-M launch in 2014. Each SkySat satellite is equipped with a Ritchey-Chretien Cassegrain telescope with a focal length of 3.6 m, and a focal plane consisting of three 5.5 Mpixel CMOS imaging detectors. 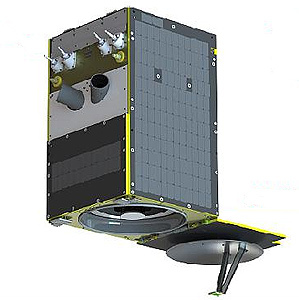 SkySat-1 and -2 use 3 CMOS frame detectors with a size of 2560 × 2160 pixels and a pixel size of 6.5 µm. The operational satellites have a higher resolution detector. The upper half of the detector is used for panchromatic capture, the lower half is divided into 4 stripes covered with blue, green, red and near infra-red color filters. The native resolution at nadir of the SkySat-1 and SkySat Cis around 1.1 m. Further satellites will be placed in lower orbits, leading to increased image resolution. Thirteen more operational satellites are being built by SS/Loral using a Skybox-licensed design, featuring a modular propuslion system. ECAPS will provide the complete High Performance Green Propulsion (HPGP) systems. Adittionally, these will feture better reaction wheels for more agility. This series is about 15 cm taller and 30 kg heavier than the first two prototypes. One of these satellites will launch in mid 2015 on an Indian PSLV-XL rocket. For more will be launched in mid 2016 on an Arianespace Vega launch vehicle. Six more will be launched on an Orbital designed Minotaur-C-3210 rocket in early 2017. The final two of this batch are to be launched on Spaceflight Industry's SSO-A multi-satellite launch on a Falcon-9 v1.2 (Block 5) rocket. Another batch of six was be ordered in January 2016. For later launches, Skybox reportedly has an agreement with Virgin Galactic to use the LauncherOne rocket. Google announced in March 2016 that Skybox Imaging had changed its name to Terra Bella. SkySat 16 (SkySat C14) - with ? SkySat 17 (SkySat C15) - with ? SkySat 18 (SkySat C16) - with ? SkySat 19 (SkySat C17) - with ? SkySat 20 (SkySat C18) - with ? SkySat 21 (SkySat C19) - with ? SkySat 22 (SkySat C20) - Option with ? SkySat 23 (SkySat C21) - Option with ? SkySat 24 (SkySat C22) - Option with ? SkySat 25 (SkySat C23) - Option with ? SkySat 26 (SkySat C24) - Option with ? SkySat 27 (SkySat C25) - Option with ?